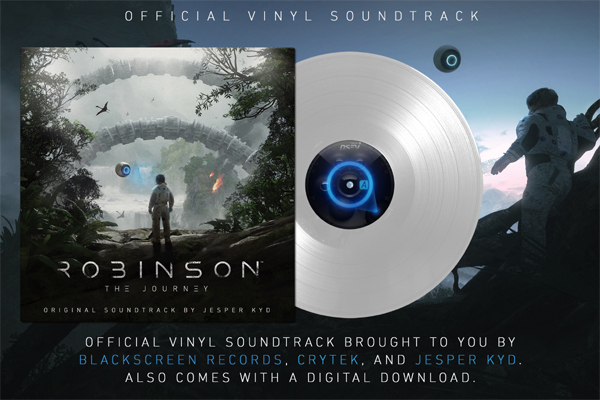 Black Screen Records announced they will be releasing the soundtrack to Crytek's newest VR game Robinson: The Journey by BAFTA award-winning and Billboard / MTV VMA nominated composer Jesper Kyd on audiophile 180g vinyl later this Winter. The digital soundtrack is out now on Bandcamp, Spotify, iTunes and all major streaming platforms worldwide. Jesper Kyd's cinematic electronic soundtrack will be available on limited edition opaque white and classic 180g black single vinyl and will come in a beautiful sleeve with original artwork by Crytek and additional layout by Dane Baudoin (Another World, Earthworm Jim). The vinyl includes a previously unreleased bonus track, will be housed in a heavy-weight inner sleeve with a shiny metallic varnish and comes with a free mp3 download code. Jesper Kyd is renowned for composing the iconic scores for the first four Assassin's Creed games, Borderlands series, Hitman series, State of Decay Series, Darksiders 2, Freedom Fighters and many more. When asked about the making of the soundtrack, Kyd said: "We worked on making the jungle come alive using analog and acoustic instruments as elements of the forest and creatures inhabiting the world of Robinson. The score is more minimal than I am used to writing and it's a music style that lends itself really well to the VR experience in Robinson."